Remodeling your home is something you should put special attention on. Nowadays it is just more than getting an upgrade on your comfort. If you make the right moves, you can end up with a healthier home, a reduce energy bill and a sustainable home that will do your bit to helping the planet. The key is using renewable energy and fuel-efficient appliances. Those will lead you to an energy saving environment while keeping your home warm, pleasant and in style. It is really impressive how a few inches can make the difference. Increase the stud distance from 16 to 24” and you will reduce the number of materials needed. This will also allow you to get additional insulation as it creates more area for it. Insulation is energy efficient because it reduces the exchange of heat through a surface such as a wall, attic, duct or roof. This means adding or expanding your HVAC ducts to areas of your home that are uninsulated (such is the case for an attic, for instance) or to those that are heated or cooled. While you are at this, you might also consider hiring a professional that checks up for leaks and makes sure that there are the right space and size for a new duct. The result will be a better energy performance and a proper exchange between old and new air. Remember: wasting water is wasting energy. That’s why you have to make sure that your home has its pipes insulated in order to get a healthy home. Another home improvement addition you can implement is moving the water heater closer to the faucet or installing demand pumps to drive hot water. This will provide you with hot water faster and better performance. Having a humidistat can have some benefits. The main advantage is that it can automatically turn on the bathroom fans and extractors when moisture levels rise. If you reduce moisture in the bathroom, there will be fewer chances of having mold. On the other side, if you go for a programmable thermostat you can also save energy. By having this installed you can adjust the temperature to the exact point of your own personal comfort. What it does is very simple, you can set the temperature changes to occur on the different times of the day and it will acclimatize your home perfectly. 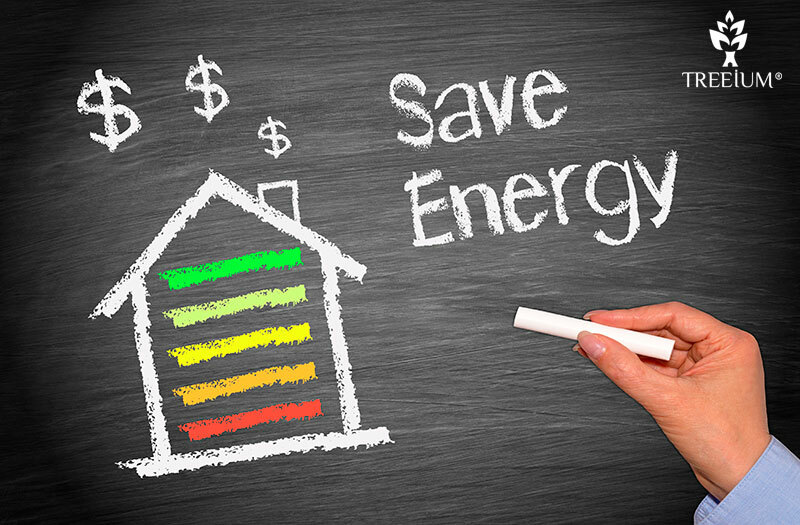 Nothing saves mas energy and is more friendly to the environment than using no energy. Why you may ask? The answer is natural light. Of course that you can rely on it all day, as your spaces will get dark in the night but taking advantage of the natural light coming from the outside during the day is a good move. There are several ways to increase the natural light in your home. There are simple ways like using mirrors, paint using bright colors or ditch heavy fabric curtains. They help but don’t make a big difference. If you are serious about using natural light you can add a skylight. It might not be cheap at first but it saves exponentially in the future energy bills. This one is considerably related to the latter. There are a lot of lighting tips to save energy: you can use the right wattage to the right room, install dimmers, use lamps instead of overhead lamps… and they truly help! But if you want to really make the difference at the end of the day you have to consider solar energy. It is the ultimate energy saver and the greatest green home improvement. It is not as out of reach as you think and this might even be the best time to do it. Since we are in the solar subject, let’s talk about passive solar strategies. This is a way of building and making amends to a home in order to collect, store, reflect, and distribute solar energy in the form of heat in the winter and reject solar heat in the summer. It means that you can use saving energy at home through design and adaptation of existing areas. This strategy considers elements such as solar aperture, season needs, energy distribution and thermal mass (among others) to design buildings. This is one strategy that you might not have heard of. Cool steel roofing is a combination of energy efficiency, resistance, and style. It has surely become popular in the last years and the trend is still growing! The main benefit for your home is that steel is an element that lasts longer than regular roofing and has a high resistance against the inclement weather. It is also fire-resistant and energy efficient as well (it helps homes to be cooler during summer). Installing exhausting fans is always a good choice. They help reduce moisture levels, which, as we mentioned before, reduces your chances of having the mold to nearly zero. These fans pull the excess of moisture from the area where you install it expelling it permanently from your home. The will also take care of smoke and odors making your air more breathable. Finally, we have left one of the best recommendations for the end. If you are a person with little time available to take care of home improvement, maybe it is best to find the right professionals to take care of the work. If your main objective is to improve the energy performance in your home, you can seek the help of a professional who carries out an energy audit. At Treeium, we have the best professionals, who will identify the potential improvements to be done in your residence while keeping your budget in mind to make sure you get the necessary adjustments without overspending. Now is the best time to go for solar energy! Get a 30% Solar Tax credit before the year ends!